Two strategies which are directly relevant to the themes of digital transformation and innovation in which OpenGov is exploring are: building strong digital capabilities and partnering to enable innovation and growth. As stated in the CFE report: Digitalisation is creating new industries and transforming existing industries. It also offers businesses an effective means of reaching global markets. Building on Singapore’s Smart Nation vision, Singapore can tap on the economic opportunities offered by the digital economy by promoting the adoption of technologies and building strong digital capabilities. Data will be an increasingly important source of comparative advantage and Singapore needs to improve her ability to use it productively in the economy. SMEs form the bulk of Singapore’s enterprises, and help should be rendered for them to adopt digital technologies. This can be done by providing expertise as well as financing support. The pace of adoption of digital technologies among SMEs can also be accelerated through national initiatives like the National Trade Platform and a National Payments Council. The Government should support the development of digital capabilities such as applied data analytics by establishing joint laboratories with industry players. Such partnerships can promote innovation and help train data scientists. The Government can also use National Service to develop deep, niche skills in cybersecurity among Full-Time National Servicemen, given the strategic importance of cybersecurity to the economy as well as national security. The Government should establish a dedicated programme office to support enterprises in making the most of data as an asset. The office can provide industry specific regulatory guidance and co-develop flagship data science projects that will have positive demonstrative effects on other enterprises. "Quality, future-oriented education cannot simply be the onus of government or public institutions to deliver. Private education institutions need to become partners with their public counterparts. These private schools should play their part by offering programmes in that foster digital capabilities for both students and the workforce alike, and contribute to Singapore’s industry-ready talent pool." The path ahead is uncharted, and the Government must strive to create an environment where Trade Associations and Chambers (TACs), unions, enterprises and individuals can come together and trust one another. TACs are valuable multipliers, leading industry-level initiatives and supporting enterprises to scale up and make inroads in overseas markets. They must step forward and lead with industry level initiatives. Unions too must help workers prepare for the jobs of the future – especially those who may be more vulnerable in a rapidly-changing economy. This includes test-bedding regulatory innovations, streamlining support schemes for enterprises, as well as reviewing and rationalising the roles and functions of government agencies that support enterprises in various ways. The Government should consider using lead demand more systematically to support the development of promising industries, especially where this coincides with Singapore’s own strategic national needs. New but promising enterprises with short track records will benefit from citing the Government as a reference customer. Rising domestic expenditures due to ageing, and global changes in tax rules will necessitate a review of Singapore’s tax system. The Government should review and reshape Singapore’s tax system to ensure that it remains broad, progressive, fair, competitive and pro-growth. The Government should ensure that even as the economy grows, attention is paid to the quality of the environment. Given the threat of climate change, Singapore should play its part in contributing to global efforts to create a sustainable environment. In that way, a high quality living environment can be maintained in Singapore for generations to come. "Beyond the usual industrial attachments and internships, companies of the future should be more forthcoming in collaborating with educational institutions and foster active networks on an ongoing basis. Close collaborations with education partners can take place on various fronts, including opportunities to tap into the competence and skills of industry-ready students – layer upon layer along their education journey – in an ongoing relationship among the industry, learning institution and students that bring win-win outcomes for all." 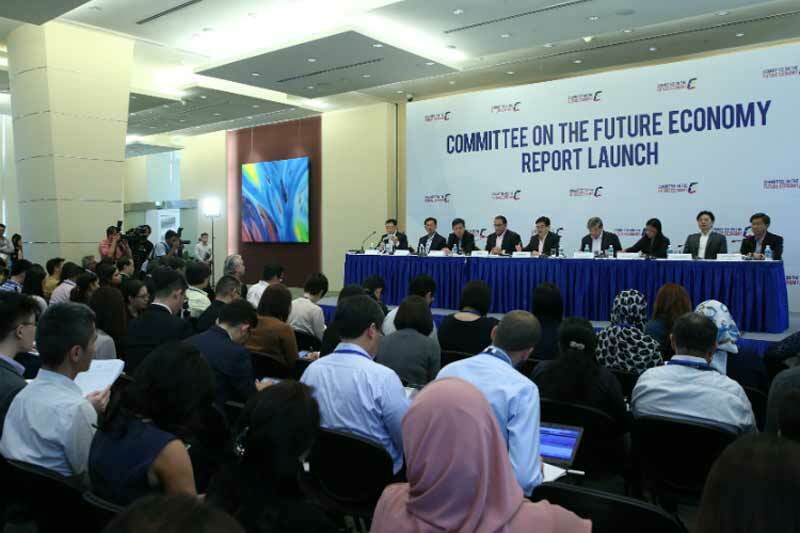 To embrace the challenges of the future economy, it is imperative for Singapore and its people to be equipped with the relevant digital skills and harnessing its existing capabilities towards building a Smart and Secure Nation. Meaningful partnerships within and across both private the public sectors will be essential for the creation of networks, relevant experience and job opportunities.